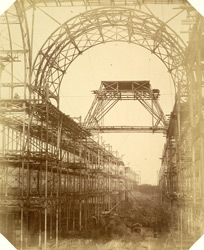 Photographer P H Delamotte records the construction of the arched nave and complex roof structure of the Crystal Palace in Sydenham Hill. After housing the Great Exhibition of 1851 in Hyde Park, Crystal Palace was dismantled and rebuilt in Sydenham, south-east London. The first column was raised on 5 August 1852 and the palace was opened by Queen Victoria on 10 June 1854.